The performance of the DuctRunner systems is best if pulled at a fairly constant speed of about 1 to 1.5 m/sec. This can be achieved using a manual or electrical winch. The DRW-312M is a modified manual hand winch (effective operational length <300m) consisting of a frame with an axis, sturdy spool, a robust handle and a fortified axis for the wheels. For longer distances as well as ease and consistency of operation we recommend using the DRW560S, a variable speed and variable torque high speed winch with a drum capacity of ±1,700m of Ø5mm rope. 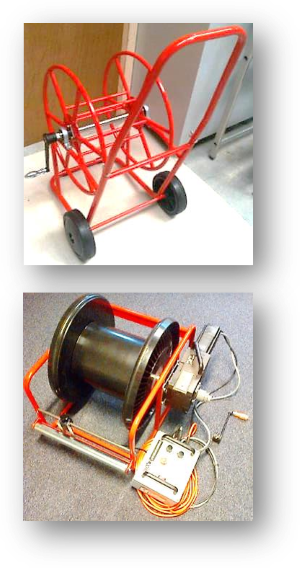 When performing a survey, Reduct highly recommends using 2 winches, one at each end. This improves accuracy and allows for multiple runs to be executed in a very short time frame.